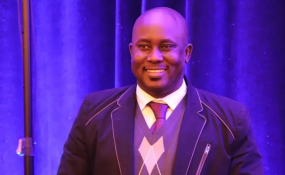 The late Adesanmi was among the 149 passengers of Ethiopian Airlines Flight ET302 from Addis Ababa to Nairobi in Kenya, which crashed on March 10. The service which held at Parkway Event Centre, Lagos, attracted professionals from different walks of life, including doctors, lawyers, bookwriters, philosophers, journalists, artisans and artists amongst others. Some of those in attendance told the News Agency of Nigeria (NAN) that they had not met the late professor personally, but had read many of his works. Molara Wood, the professor's former colleague at Carleton University, Canada, who was at the service described him as a thoughtful and insightful human being, who beamed with kindness and decency. She said that "Had that plane not dropped from the sky, Adesanmi would have become the "Juggernaut of African Thought". "He never gave chance for odds to deter his relationships with people, no matter the strata. "He was always in charge of knowledge despite a prolific writer and speaker the world has already known him to be. "One major attribute that Nigerian youths must emulate from the Adesanmi is consistent passion for education. "Nigerian youths must be passionate about education. " Also, a book writer, Olusegun Adeniyi, regretted that Mr Adesanmi was too young to die at 47. "But as the saying goes, "It is not the years in one's life that counts, but the life in one's years. On his part, Phillip Adekunle vowed to immortalise the late professor with village libraries.